These ultrasonic tooling torque wrenches will assure correct assembly of ultrasonic stack components (converter, booster and horn). Repeatable quantitative torquing is vital when assembling these components to eliminate problems such as heating, stack squealing and stripping of threads. Adjustable spanner ends fit most boosters and horns. The adjustable flat wrench is great for positioning half-wave or timed tips on full-wave horns. Torque range is from 0-80 foot-pounds. 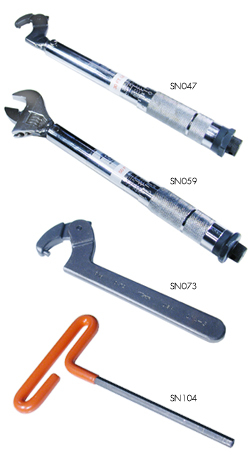 These adjustable, pin spanner wrenches are used to loosen the interface of the convertor, booster or horn. Use them in combination with a torque wrench for accurate tightening. Wrenches come in the standard length or the hard-to-find extra long size. These multi-purpose wrenches are a one-piece hex key made of alloy steel, with a cushion-grip handle. Keep one handy for quick tooling jobs. Loosen or tighten any object with a diameter of 3/4″ to 7″. This wrench works great on irregularly shaped objects. Simply place the wrench on the object, tighten the strap until snug and turn. 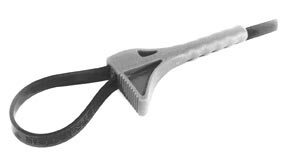 The strap wrench has a sturdy 8″ polypropylene handle and a 24″, oil and solvent-resistant, synthetic rubber strap with a tensile strength of 4,250 psi. For tightening or loosening large ultrasonic horns, it’s great!